At Dogs On The Farm & Cats Too, we believe that dogs deserve a vacation too! We provide either a 4 hour Doggie Daycare session or an Individual Play session for every boarding dog, and offer a range of activities and services (including additional daily daycare or individual play sessions) to personalize your dog's stay. Your dog won't have time to miss home while they are having fun, and will sleep soundly all night, tuckered out from their busy day. We recommend personalizing your dog’s stay with additional activities and services. We would be happy to help you choose the best activities for your dog. All of our rooms have comfortable Kuranda beds and all are fully climate controlled. 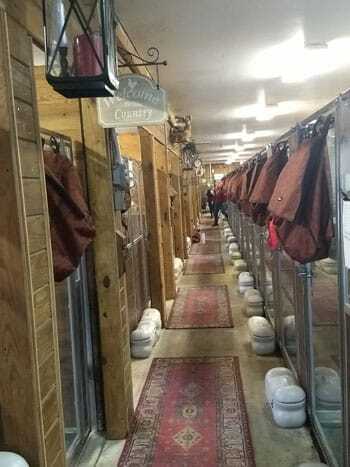 Our Signature Stable Suites are 6ft by 10ft with cozy country décor, child sized beds, wood panel walls, personal toy bins, and in-room windows providing natural lighting. Great for any dog and perfect for family dogs! Our Farm House Suites are 4ft by 6ft suites with cozy country décor, large comfortable Kuranda beds and personal toy bins. 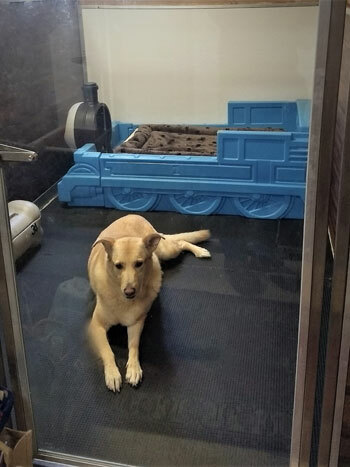 Our Mootel Rooms are traditional large boarding crates and they include comfortable Kuranda beds and personal toy bins. These rooms are perfect for crate trained dogs!